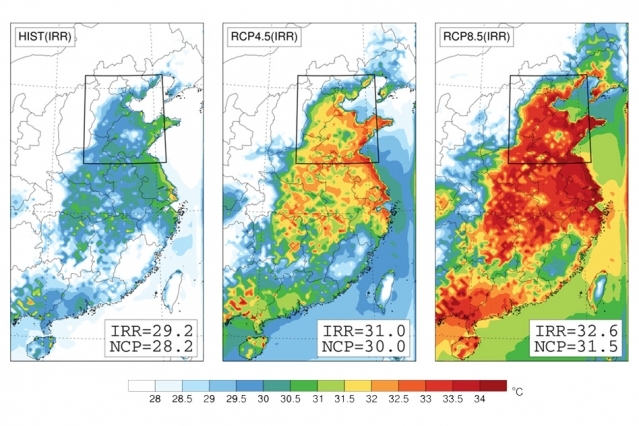 China could face deadly heat waves due to climate change. One of the world’s most densely populated regions may push the boundaries of habitability by the end of this century, study finds. "The response is significantly larger than the corresponding response in the other two regions," says Eltahir, who is the Breene M. Kerr Professor of Hydrology and Climate and Professor of Civil and Environmental Engineering. The three regions the researchers studied were picked because past records indicate that combined temperature and humidity levels reached greater extremes there than on any other land masses. Although some risk factors are clear — low-lying valleys and proximity to warm seas or oceans — "we don’t have a general quantitative theory through which we could have predicted" the location of these global hotspots, he explains. When looking empirically at past climate data, "Asia is what stands out," he says. Although the Persian Gulf study found some even greater temperature extremes, those were confined to the area over the water of the Gulf itself, not over the land. In the case of the North China Plain, "This is where people live," Eltahir says. The key index for determining survivability in hot weather, Eltahir explains, involves the combination of heat and humidity, as determined by a measurement called the wet-bulb temperature. It is measured by literally wrapping a wet cloth around the bulb (or sensor) of a thermometer so that evaporation of the water can cool the bulb. At 100 percent humidity, with no evaporation possible, the wet-bulb temperature equals the actual temperature. "This spot is just going to be the hottest spot for deadly heat waves in the future, especially under climate change," Eltahir says. And signs of that future have already begun: There has been a substantial increase in extreme heat waves in the NCP already in the last 50 years, the study shows. Warming in this region over that period has been nearly double the global average — 0.24 degrees Celsius per decade versus 0.13. In 2013, extreme heat waves in the region persisted for up to 50 days, and maximum temperatures topped 38 C in places. Major heat waves occurred in 2006 and 2013, breaking records. Shanghai, East China’s largest city, broke a 141-year temperature record in 2013, and dozens died. To arrive at their projections, Eltahir and Kang ran detailed climate model simulations of the NCP area — which covers about 4,000 square kilometers — for the past 30 years. They then selected only the models that did the best job of matching the actual observed conditions of the past period and used those models to project the future climate over 30 years at the end of this century. They used two different future scenarios: business as usual, with no new efforts to reduce emissions; and moderate reductions in emissions, using standard scenarios developed by the Intergovernmental Panel on Climate Change. Each version was run two different ways: one including the effects of irrigation, and one with no irrigation. "Irrigation exacerbates the impact of climate change," Eltahir says. In fact, the researchers report, the combined effect, as projected by the models, is a bit greater the sum of the individual impacts of irrigation or climate change alone, for reasons that will require further research. The bottom line, as the researchers write in the paper, is the importance of reducing greenhouse gas emissions in order to reduce the likelihood of such extreme conditions. They conclude, "China is currently the largest contributor to the emissions of greenhouse gases, with potentially serious implications to its own population: Continuation of the current pattern of global emissions may limit habitability of the most populous region of the most populous country on Earth." "This is a solid piece of research, extending and refining some of the previous studies on man-made climate change and its role on heat waves," says Christoph Schauer, a professor of atmospheric and climate science at ETH Zurich, who was involved in the work. "This is a very useful study. It highlights some of the potentially serious challenges that will emerge with unabated climate change. … These are important and timely results, as they may lead to adequate adaptation measures before potentially serious climate conditions will emerge." Schauer adds that "While there is overwhelming evidence that climate change has started to affect the frequency and intensity of heat waves, century-scale climate projections imply considerable uncertainties" that will require further study. However, he says, "Regarding the health impact of high wet-bulb temperatures, the applied health threshold (wet-bulb temperatures near the human body temperature) is very solid and it actually derives from fundamental physical principles."